We are deeply saddened to hear about the passing of Former President George H.W. Bush. We give thanks for his years of service, leadership, and friendship. In 1986, immediately following the Challenger accident, Vice President Bush was the first person to express his grief and great sorrow to our families. Speaking for himself, the President, and the nation, he personally met with the families and gave us a note with his home phone number and a message “call if you need us.” He was one of our country’s greatest leaders and a figurehead around the globe, but we remember his incredibly compassionate heart and his willingness to offer us his friendship during an extremely dark moment in our lives. 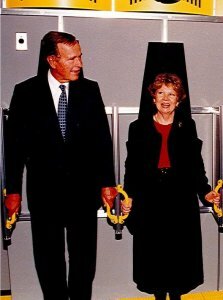 President and Mrs. Bush quickly became the first people to voice their steadfast support for our efforts to create Challenger Center. In the years following the tragedy, they continued to provide leadership and guidance celebrating major milestones with the organization, visiting Challenger Learning Centers and watching our students “fly” to space. President Bush’s dedication and sage advice are what helped grow our network of Challenger Learning Centers both nationally and internationally. Just prior to our organization’s 30th anniversary, we visited President Bush in Houston and asked him if he would consider being Challenger Center’s Honorary Chair. He graciously agreed and told us that we forever had his support. 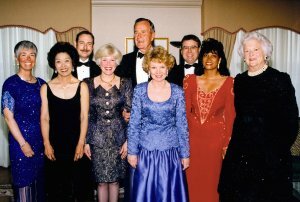 As we remember President Bush, we hold fondly in our hearts the private moments we shared with him, the consoling words he offered during the dark days following the accident, and the encouragement he bestowed on us as we moved forward with our vision to remember our loved ones in an extraordinary way. His words and actions allowed us to turn our tragedy into a triumph. We will remember President Bush for all that he did for this country, for his leadership, for his service, and most of all, for his friendship. 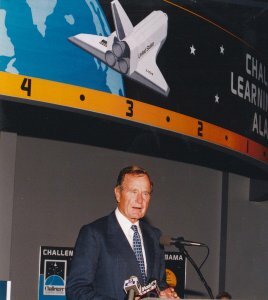 Challenger Center has sparked that change in the lives of more than 5 million students, and that would not have happened without President Bush. But the President changed our lives as well, and for that we will forever be grateful. On behalf of Challenger Center’s Board of Directors and the Challenger Center family, we send our heartfelt condolences to the entire Bush family.